No matter where the fight or when, no matter if it's a fantasy world, a distant planet, or the daily fight for life and challenges, she'll be there, as she's the Battle Queen, all passion and energy. A must have for Gia 7! "Battle Queen" adds the degree of realism in expressions that you need for the new generation of Iray renders. Every detail in the face has been adjusted to make your characters look real and alive. 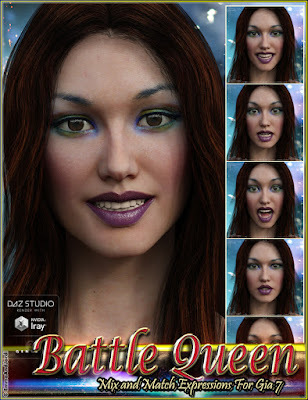 Battle Queen is a pack of expressions organized in three folders (Full Face, Upper Face, and Lower Face) for Gia 7. With them, you can apply an expression that moves all the face, or partial expressions that move only the upper or lower parts of the face.